November 29, 2018 – The Central Bank of the Bahamas released their latest currency note on the 27th September 2018, which is part of a new series or family of banknotes. The $20 denomination is the third note in the series, which also sees a vertically designed reverse side and with regard to this particular denomination, a new scene or depiction of Nassau Harbour is featured. 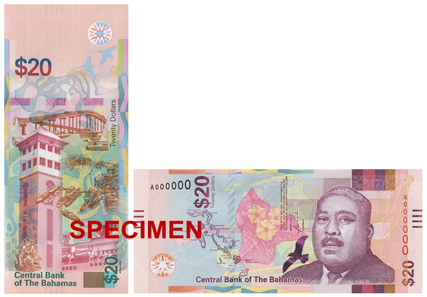 The new 20 Dollar banknote features the first Bahamian Governor-General, Sir Milo B. Butler. Photo: Central Bank of the Bahamas. The introduction of the CRISP technology, (Counterfeit Resistant Integrated Security Product) began on the 3rd August 2005, and the first family of banknotes to use this technology with the release of the initial denomination, the CRISP $10 note. This was the first family of banknotes in Bahamian history to offer a range of denomination-specific features that was specifically designed to combat denominationally up-rated forgeries. These denomination-specific features are designed to help the public tell whether or not the banknotes in their hands are genuine. CRISP banknote paper is also coated with a new sizing agent to help prevent the chemical removal of inks from the paper. The Bahamian dollar was introduced in 1966 by authority of the Bahamas Government that replaced the British pound seven years before the colony attained independence and in denominations of 1/2, 1, 3, 5, 10, 20, 50 and 100 dollars. The Bahamian Dollar’s official exchange rate was fixed at one dollar equalling 7 shillings, which was also equal to one US Dollar with their fixed rate at £1 = $2.80. This scenario would eventually lead to the establishment of parity with the US currency at a one to one ratio. Curiously, three Dollar banknotes were issued, in an effort to ease transactions and encourage the use of decimalisation and since this denomination closely equalled the value of the previous Pound sterling notes. Even more unique fifteen cent coins were also issued as they were close in value to an old shilling at the time of monetary transition. The three dollar banknotes and 15 cent coins are still in circulation and issued in the Bahamas though they are rarely used. In 1968, the Bahamas Monetary Authority was established and issued coins and currency from then with this authority with the Central Bank of the Bahamas taking over from 1974. All banknotes initially carried images of the country’s head of state, HM Queen Elizabeth II until 1995 when the denominations of the 1 to 50 dollar notes were replaced with images of prominent Bahamian politicians. The second family of banknotes continuing to incorporate the CRISP technology was begun in 2016 with the release of a new $10 banknote, followed by the one Dollar note the year after. The third note included in this series is the $20 which continues to include an illustration of the first Bahamian Governor-General, Sir Milo B. Butler (1906-1979) on the front of the note. Predominantly magenta with shades of pink, green, orange, blue and yellow, the banknote measures 156 mm / 67 mm, the series year of “2018” and the signature of the current Governor of the Central Bank of The Bahamas together with the promissory text “Central Bank of The Bahamas. These notes are legal tender under the Central Bank of The Bahamas Act 2000 for the payment of any amount Twenty Dollars”. A watermark of Sir Milo B. Butler and the numeral $20, a replica map of the islands of The Bahamas, and the denominational value in words and figures appear on the left, with an image of a bougainvillea flower in the centre. The reverse side features the vertically formatted likeness of the tower at Festival Place overlooking the Nassau Harbour. The numeral $20 appears in the upper left and lower right corners, while the words “Twenty Dollars” flank the Sir Sidney Poitier and Paradise Island bridges. Just below the tower is the Coat of Arms of the Commonwealth of The Bahamas along with the words “Central Bank of The Bahamas”. Also incorporated on the reverse of the $20 banknote is an Active security thread, which is a colour shifting thread incorporating a fine line printing under a lenticular layer. Solid Security Thread. A thread which appears as a solid line rather than just appearing on the surface of the note in segments. Colour-shifting ink application. On the front of the banknote is a bird shape that changes colour from metallic purple to green as the note is tilted. Iridescent Print. There is a subtle, lustrous golden band across the back of the note which includes repeating images of the letters CBB, $20 and the shape of a shark. Micro-text print. Below the portrait of Sir Milo Butler, a field of colour appears like plain areas of print or simple lines. But when viewed using a magnifying lens, micro-text print can clearly show the text ‘CBB’ and ‘20 Dollars’. The “Evolution” series of new banknotes was first issued in 2016. Photo: Central Bank of the Bahamas. 1 Dollar – 2017. 67 / 156 mm. Predominant colour of Green. The obverse or front side includes a portrait of Sir Lynden O. Pindling (1929-2000) who was the country’s first Prime Minister when the Bahamas attained independence in 1973. The back or reverse side features a vertical design which includes the likeness of a Drum Major in full regalia, leading the Royal Bahamas Police Force’s marching band, with the trailing band members adjacent. The new 10 Dollar banknote depicts Sir Stafford Sands. Photo: Central Bank of the Bahamas. 10 Dollars – 2016 67 / 156 mm. Predominant colour of blue. The obverse or front side includes a portrait of Sir Stafford Sands (1913-1972) former finance minister of the Bahamas. The back or reverse side features a vertical design and includes a vignette depicting a rendering of Hope Town Lighthouse, located on the island of Abaco along with two flamingos. 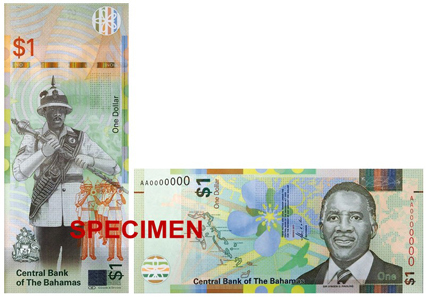 The vignette is flanked above by the numeral $10, and to the right by the words “Ten Dollars”, and below with the Coat-of-Arms of the Commonwealth of The Bahamas. 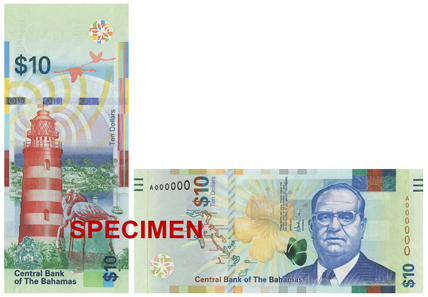 The Central Bank of the Bahamas have also announced they are preparing for the release of the $50 banknote in 2019. New versions of the $1/2 and $3 banknotes are also slated for issue in 2019. The author, Michael Alexander is president of the London Banknote and Monetary Research Centre. For additional information on this and other banknotes & coins issued by the Central Bank of the Bahamas, please visit their website.